This delicious boiled potato and apple salad is a perfect snack for pre-workout and post-workout nutrition. Super easy to make and super yum to taste! Here is the full recipe of boiled potato and apple salad. You can eat it cold or as it is. Anything and every thing can be eaten in a limited amount even if you are on weight loss. Please dont deprive yourself of any food. specially if you are working out hard in a gym, you would need a good carb meal as a pre workout meal, to be able to gather your stamina while you work out to burn fat. iF you are working out have it 2-3 times a week, if you are not working out / walking , have it once a week. 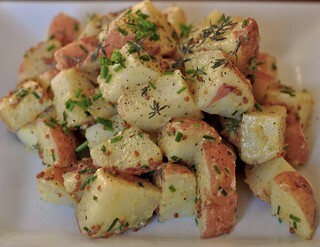 Can boild potato and apple salad help in weight loss? Hi Rose, yes you can use it as your pre workout snack. and it will help in weight loss ! i would like to start this diet. my insulin level is high will this diet help me ? i did many types of medicine but nothing worked out. I have a small query. Can we add salt and pepper in fruits and vegetables or does it need to be completely bland. Hi Rexilla , can you please describe your problems in details , as i am unable to understand the current situation . according to BMI , i need to gain atleast 7-8 kg weight. I also going gym evening time. Is this time is right for gyming? and what can i do for gaining 7-8 kg weight in 2-3 months??? Thanks for reading at dietburrp. weight gain is a tricky process. you need to balance with calorie intake while making sure that the calories comes from healthy protein foods. the diet chart mentioned in the above article – https://www.dietburrp.com/indian-diet-plan-for-weight-gain/ is a perfect way to provide healthy calories to your body. Can I have barley water with lemon juice in it, during the GM diet.. I am trying this diet for the first time and today is my only fruit day.. I need to loose 35 kgs.. also I am on anti fungal medication and also take anti stress pills along with calcium and vitamin pills for my very severe lower back pain.. kindly help..
this diet is not recommended with anti stress pills. it may cause acidity . please be very careful. barley water is ok for you to have because with so many medications , you would need it . I’m Lakshmi , mother of a one year old kid n I’m 70 right now and my height is 5’5″. Can I also follow this plan for a month.